Our mission is to provide childcare in a mixed-age and family-like setting for children ages 2.9 to 5 years old. We foster the independence and growth of your child on a variety of levels. As your child is loved and nurtured, they engage in age appropriate activities and play. 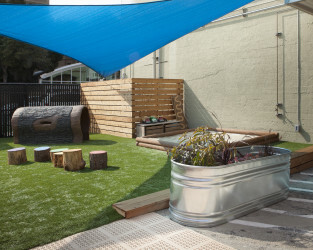 We provide a nurturing space where children are willing and comfortable to take risks, as they learn and grow along the way. We foster social emotional development daily, which builds empathy and interpersonal skills that carry on into new environments. We appreciate the individuality of each child while teaching children how to work cooperatively with others. We facilitate productive and thoughtful conversations amongst the children as we explore new concepts together as side-by-side learners. At this developmental level, we hope to instill that the process is more important than the product and we provide an open-ended curriculum that supports diverse learning styles. Opportunities to develop preschool skills, such as cutting with scissors or writing names, are planned and available for those children that seek to learn them. We practice fine motor development through hands-on projects and manipulatives. We work on large motor skills through regular outdoor play, games, and onsite classes such as yoga and gymnastics. We will promote rhythm, listening skills, and appreciation of music by offering music class and daily song and movement. In the spirit of nurturing the whole child, we offer healthy and primarily organic snacks and cooking projects. More importantly we provide an atmosphere in which your child will feel safe, secure, and comfortable trying new things. We view our relationship with families as a partnership and we seek to build a strong community that supports both family and child alike. Our staff works collaboratively on all levels of our program. We enjoy continued professional growth through in house education as well as seeking outside opportunities, which help us learn and grow as educators. We view this time in a child’s life as a pivotal point in their development as citizens of the world and we take great pride in helping children become their best selves.